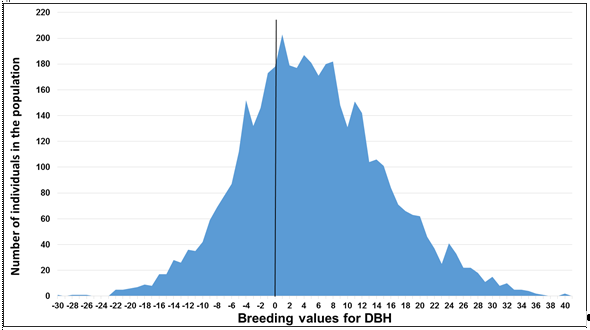 Breeding value (BV) is the value of inheritable trait(s) of an individual measured by the performance of its progeny in field trials. Breeding values have been routinely used by breeders as an indication of the genetic quality of an individual as a parent. BVs are calculated from the actual field trial data and are expressed as a deviation from the population mean so it usually carries a plus or minus sign. 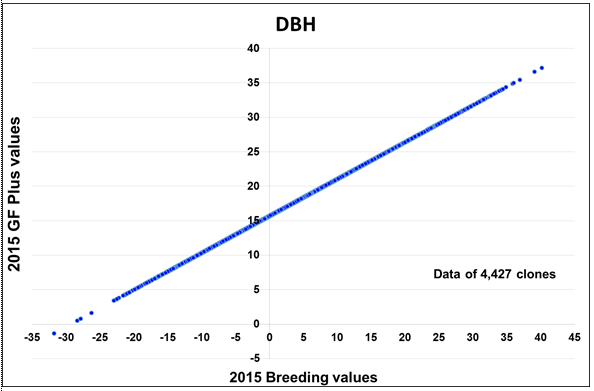 The following graph shows the distribution of the Radiata Pine Breeding Company's (RPBC's) 2015 BVs on tree growth (diameter at breast height) of all the clones in the breeding population where zero on the horizontal axis is the population mean. BVs for growth in the population ranged between -30 and +40. Clones on the right hand side of the graph grow faster than the clones on the left hand side. The GF Plus™ genetic rating system introduced by the RPBC in 1998 is a simple transformation of the BVs, so nearly all the values are above zero. This made the values between clones easier to compare. The following graph shows the linear relationship between the 2015 BVs on growth and its corresponding GF Plus values. The population mean in the GF Plus™ system for growth is around 15.5, and the range is between -1 and 37. BVs are re-calculated every year for all RPBC clones with new field trial data added to the calculation. As a result, there are always ups and downs of the GF Plus™ values for many of the production clones commonly used in the seed orchards. The changes sometimes can be significant, especially when large numbers of trial data or new clones are added to the calculation. It is also worth noting that the range and slope of the correlation between BVs and GF Plus™ values can vary among traits. The GF Plus™ values should be treated independently for each trait.